Want a treehouse? Get in touch. 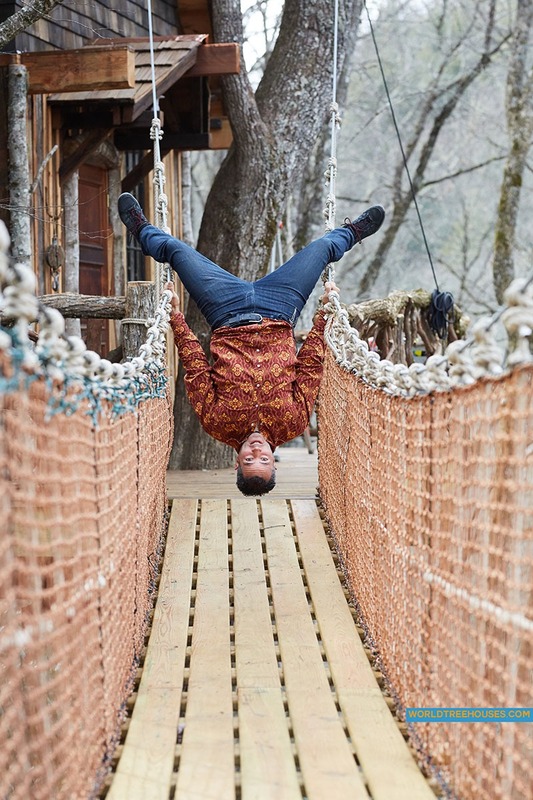 NC treehouse builders : Panthertown: Owner, Adam Laufer, on suspension bridge Our owner, Adam Laufer, enjoys a different kind of view from the suspension bridge leading to our new Panthertown treehouse ! 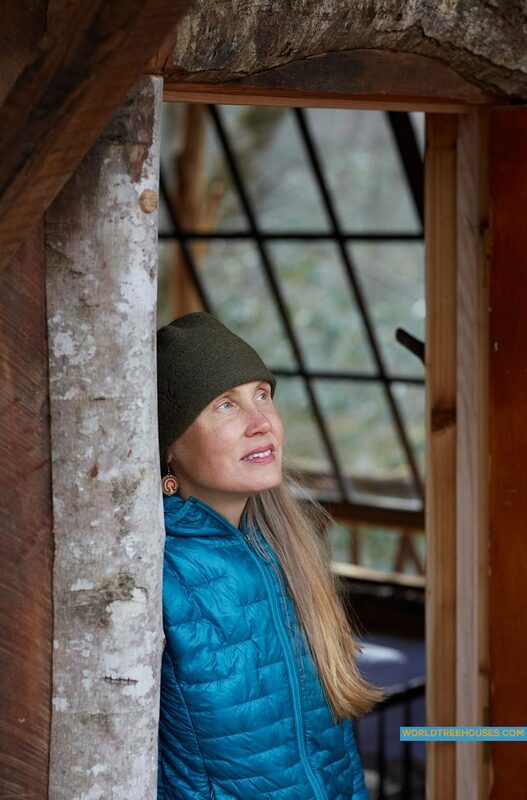 Our treehouses for individuals and families in the Asheville and WNC area can be a guest room, a studio, or your own private getaway on your land (or in your backyard!). Contact Adam if you want your own retreat in the trees. View more photos of this western North Carolina treehouse in the Panthertown wilderness. We’ll be posting many more photos in the upcoming weeks. View our blog for even more. The mountains of North Carolina are a perfect place for your tree house. World Treehouses is an Asheville-based builder of treehouses, tree platforms, rope and suspension bridges, and other tree-centered projects. Want a tree house in the Asheville NC area or beyond? Get in touch. 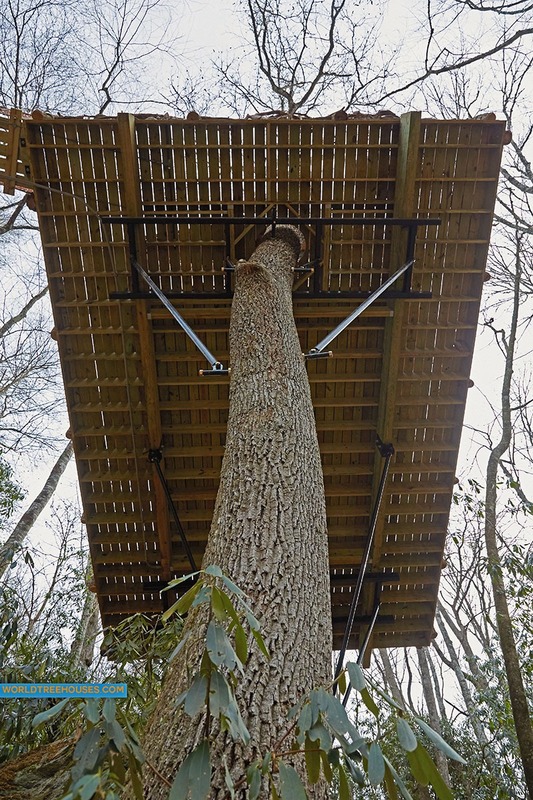 WNC treehouse builders : Panthertown treehouse – looking up up up! 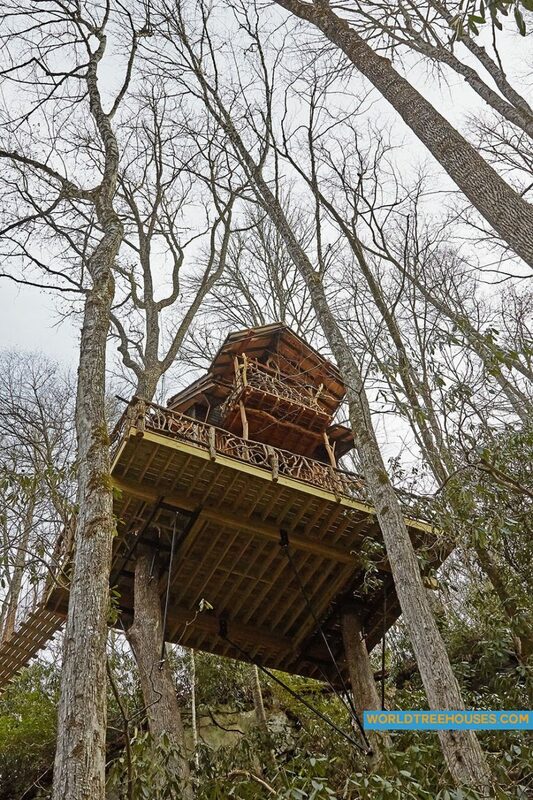 WNC treehouse builders : Panthertown treehouse – looking up up up! Looking up up up to the World Treehouses project in the Panthertown area of western NC is breathtaking! This two-story treehouse is entirely tree-suspended, using specialty steel hardware to ensure the least impact to the trees that are its home. View more photos of this western North Carolina treehouse in the Panthertown wilderness. We’ll be posting many more photos in the upcoming weeks. View our blog for even more. The mountains of North Carolina are a perfect place for your tree house. World Treehouses is an Asheville-based builder of treehouses, tree platforms, rope and suspension bridges, and other tree-centered projects. Want a tree house in the Asheville NC area or beyond? Get in touch. 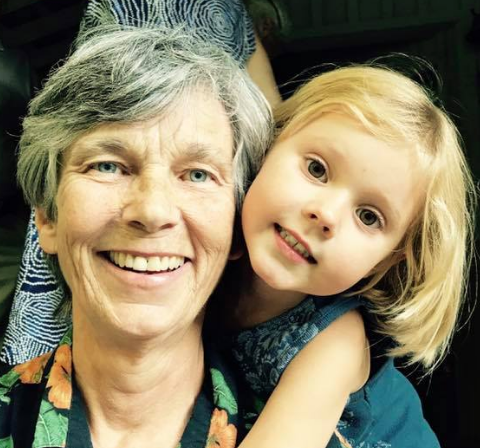 WNC tree house builder : Panthertown Asheville treehouse dreaming Dreaming of a treehouse in the Asheville NC area or beyond? Contact us to set up a site visit to your property to see if you have good, strong trees to hold one of World Treehouses’ creations! This photo showcases the custom window-frame and woodwork of our most recent creation. View more photos of this western North Carolina treehouse in the Panthertown wilderness. We’ll be posting many more photos in the upcoming weeks. 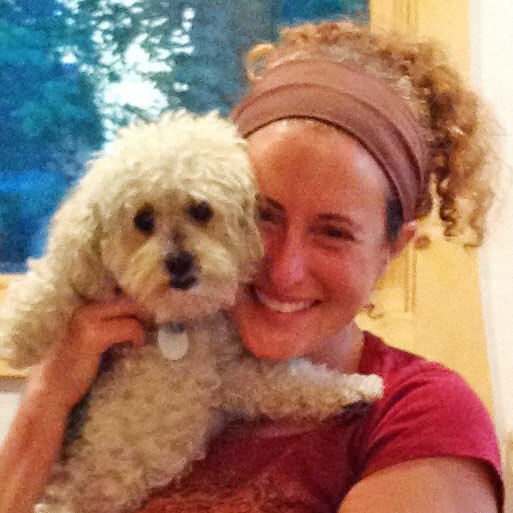 View our blog for even more. The mountains of North Carolina are a perfect place for your tree house. World Treehouses is an Asheville-based builder of treehouses, tree platforms, rope and suspension bridges, and other tree-centered projects. Want a tree house in the Asheville NC area or beyond? Get in touch. 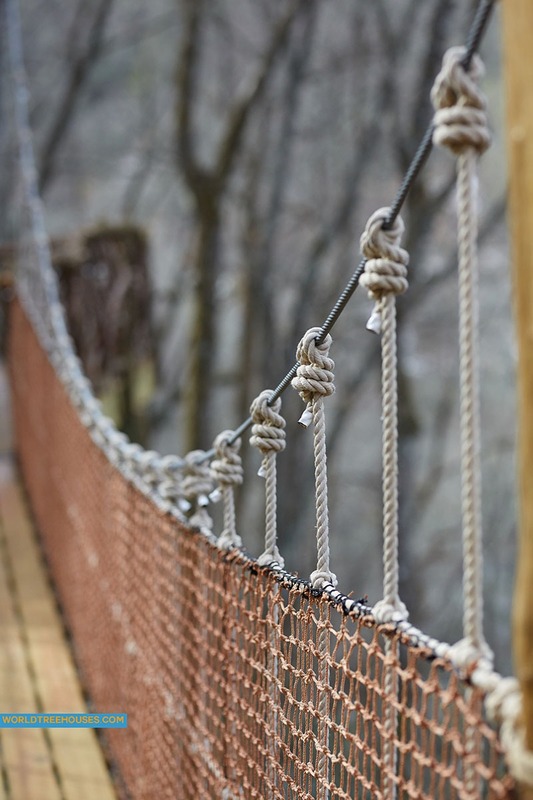 WNC treehouse builder: Panthertown rope bridge detail The graceful suspension bridge leading to our latest treehouse was built by the talented World Treehouses team. View more photos of this western North Carolina treehouse in the Panthertown wilderness. We’ll be posting many more photos in the upcoming weeks. View our blog for even more. The mountains of North Carolina are a perfect place for your tree house. World Treehouses is an Asheville-based builder of treehouses, tree platforms, rope and suspension bridges, and other tree-centered projects. Want a tree house in the Asheville NC area or beyond? Get in touch. NC treehouse builders: Panthertown Adam Laufer in harness for climbing When you climb big trees for a living, safety comes first. Asheville, NC-based World Treehouses’ owner, Adam Laufer, is in harness for a climb up into the massive trees that are the generous hosts for our most recent treehouse project. 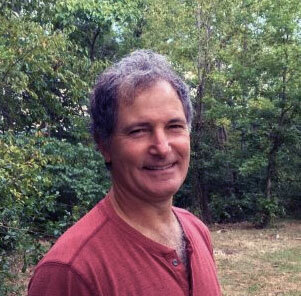 Learn more about Adam, his tree-lovin’ team, and our treehouses on our website. View more photos of this western North Carolina treehouse in the Panthertown wilderness. We’ll be posting many more photos in the upcoming weeks. View our blog for even more. The mountains of North Carolina are a perfect place for your tree house. World Treehouses is an Asheville-based builder of treehouses, tree platforms, rope and suspension bridges, and other tree-centered projects. Want a tree house in the Asheville NC area or beyond? Get in touch. WNC tree house builders : Panthertown Window to the Treetops Open a window to a new, refreshing perspective with a treehouse from World Treehouses. 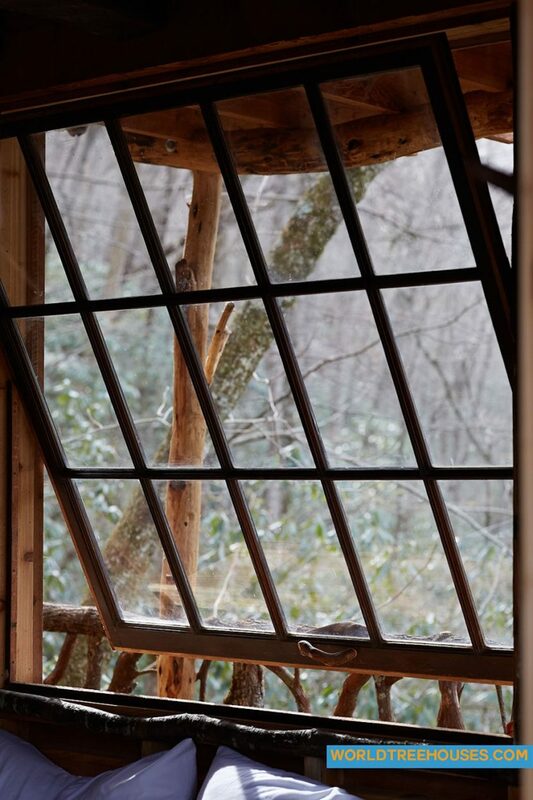 This treetop retreat in the Panthertown wilderness of WNC is filled with custom touches, including this vintage window, enabling its owners and their guests to look out over the forest from their vantage point 30 feet above the ground! View more photos of this western North Carolina treehouse in the Panthertown wilderness. We’ll be posting many more photos in the upcoming weeks. View our blog for even more. The mountains of North Carolina are a perfect place for your tree house. World Treehouses is an Asheville-based builder of treehouses, tree platforms, rope and suspension bridges, and other tree-centered projects. Want a tree house in the Asheville NC area or beyond? Get in touch. WNC treehouse builders:Panthertown laurel railing details 1 The mountain laurel branches in this railing on the upper floor of our latest WNC treehouse are one of the many custom touches that fill this two-story structure. For this treehouse, we crafted the interior and exterior with beautiful details offered by the generous forest surrounding it. From these laurel branches to locust and maple from the land, this “masterpiece in the trees” is almost more tree than it is house, enhancing the experience of escape into nature. View more photos of this western North Carolina treehouse in the Panthertown wilderness. We’ll be posting many more photos in the upcoming weeks. View our blog for even more. The mountains of North Carolina are a perfect place for your tree house. World Treehouses is an Asheville-based builder of treehouses, tree platforms, rope and suspension bridges, and other tree-centered projects. Want a tree house in the Asheville NC area or beyond? Get in touch. 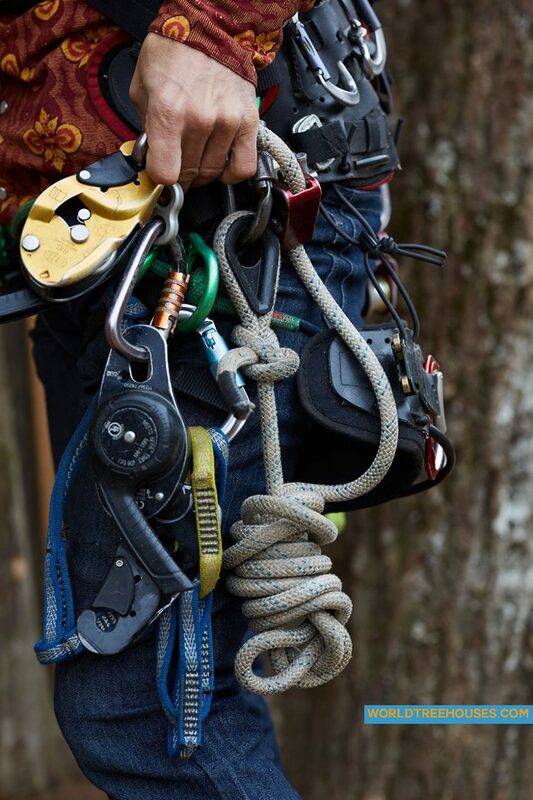 WNC tree house builder : Panthertown Adam Laufer treehouse builder tying knot When your life depends on the perfect knot, you take the time to tie it well! 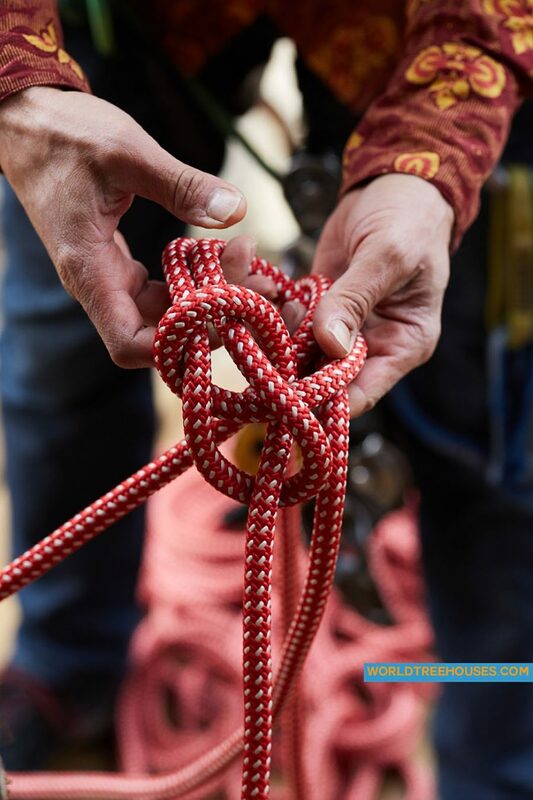 World Treehouses’ owner, Adam Laufer, ties a bowline knot to anchor his rope to the tree, so he can climb up safely.Learn more about our Asheville NC-based company and our treehouses by exploring our blog. View more photos of this western North Carolina treehouse in the Panthertown wilderness. We’ll be posting many more photos in the upcoming weeks. View our blog for even more. The mountains of North Carolina are a perfect place for your tree house. World Treehouses is an Asheville-based builder of treehouses, tree platforms, rope and suspension bridges, and other tree-centered projects. Want a tree house in the Asheville NC area or beyond? Get in touch. Asheville treehouse builder : Panthertown Railing Detail 1 It’s all in the details! 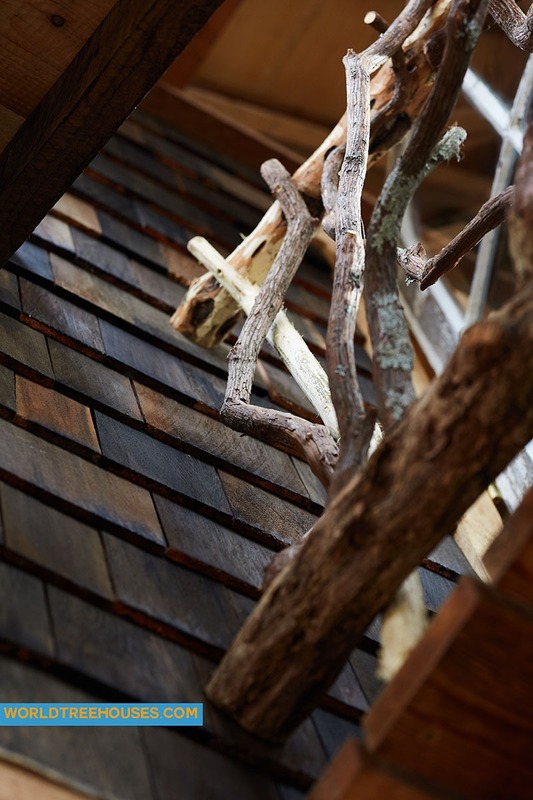 With recycled materials or branches and trees harvested from the forest around our recent Panthertown wilderness project, our team of craftsmen filled this custom treehouse with special details. 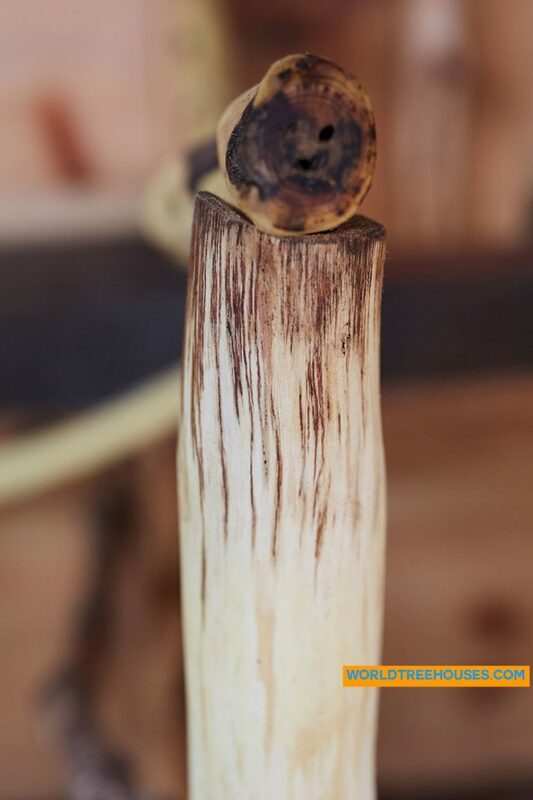 The natural grain pattern in this locust-branch railing helps the owners of this treehouse and their guests revel in the exquisite beauty of the natural world and the trees. View more photos of this western North Carolina treehouse in the Panthertown wilderness. We’ll be posting many more photos in the upcoming weeks. View our blog for even more. The mountains of North Carolina are a perfect place for your tree house. World Treehouses is an Asheville-based builder of treehouses, tree platforms, rope and suspension bridges, and other tree-centered projects. Want a tree house in the Asheville NC area or beyond? Get in touch. WNC treehouse builder : The Foundation of a Beautiful Treehouse What’s the foundation of a good treehouse ? Standing on the forest floor, 30 feet beneath our latest project in the wilderness of Panthertown in western North Carolina, you’ll see a breathtaking view of our building team’s craftsmanship, including custom-made steel hardware engineered to have the very least impact on our generous hosts, the trees. View more photos of this western North Carolina treehouse in the Panthertown wilderness. We’ll be posting many more photos in the upcoming weeks. View our blog for even more. The mountains of North Carolina are a perfect place for your tree house. World Treehouses is an Asheville-based builder of treehouses, tree platforms, rope and suspension bridges, and other tree-centered projects. Want a tree house in the Asheville NC area or beyond? Get in touch. Our treehouse (an Adam Laufer original) is better than a mailman. Rain, snow, sleet or hail, the house commands. Hurricane tails? No prob. Sometimes it feels like a ship on the ocean. I do ♡♡♡♡♡ the trees and their house! To connect about a treehouse project now, use our contact form. Otherwise, please sign up for our mailing list below. Site creation by Spice Up the World.